"Investment quality vacuum tube electronics"
Hello, my name is Mike Urban and I would like to welcome you to my website specializing in Antique Radios & Vintage Hi-Fi! My fascination with electronics started in the 70s when I obtained my Electronic Engineering degree from Penn State University and my FCC radio license. Ive always had a particular interest in radio which provided me with hours of entertainment listening to local sports broadcasts -- this was before cable TV -- as well as, tuning to programs coming via shortwave signal from all over the world! Upon purchasing my first vacuum tube radio at a garage sale, an international Grundig 3095, housed in a beautiful blond wood cabinet, I discovered the superior quality of tube sound amplification. The radio sounded so real that voices were almost with you in the room and the music had a warm, rich, full-bodied tone. After graduating from college, I embarked on a 20-year corporate career developing computer and audio/video products for General Electric, Olivetti, Apple Computer, Quantel, and Barco. Currently, I've settled in Windsor, Connecticut (conveniently located along I-91 & I-84 outside of Hartford), with my wife Suzanne Ebeling-Urban, a commercial artist and owner of Smirking Goddess Studio (www.smirkinggoddess.com). I've decided the time was right to do something that I truly enjoy, combining my enjoyment for music and sharing my appreciation of vintage audio with others. Thus, www.urban-antiqueradio.com was born (1999). I can thank Suzanne for discovering my real talent! Today, my passion is vintage audio repair & restoration and offering to you, the "warm" tube sound that I discovered long ago. In addition, many of these radios are truly "works of art". So, Ive dedicated my time to obtaining and bringing back to life, these beautiful radio products that made modern communications possible. Furthermore, I have expanded beyond sales as you will find here: audio repair business. My goal is to provide you, our valued customer, with the best quality workmanship and Customer Service, from anywhere, anytime, via the Internet. So, stay tuned, put me in your Favorite Places or Bookmark List and check back often! Thank You for thinking of UrbanRadio & Vintage Hi-Fi! "Fairfield engineer restores antique radios as a labor of love"
FAIRFIELD -- Michael Urban said the idea for his collectible radio business was always right in front of him, but he just "couldn't see the forest for the trees." The electronics engineer dutifully reported to work every day, while also pursuing his hobby of collecting old radios and other memorabilia that caught his eye. Last year, after marrying Suzanne Ebeling, an artist and illustrator who runs her own business, Urban, 45, envied the way she made a living by pursuing her creative passions. Ebeling suggested that Urban turn his own passion for fixing electronics and buying collectibles into a business of buying, repairing and selling antique radios. "It's a huge market. The collector base is out there," Urban said. His hobby-turned-full-time-business, Urban Radio, now crowds the couple's second floor Post Road apartment. Urban and Ebeling are not surprised that some people are attracted to old radios, especially those from the 1920s and '30s. After all, the sound quality, wood craftsmanship and styling readily attract nostalgic buyers. What is surprising is the broad-based popularity of the old radios. Since starting the business a year ago, Urban said he has sold about 100 radios, primarily through his Web site, www.urban-antiqueradio.com, and Ebay, the Internet auction site. "They are not just pieces of furniture," Ebeling said. "They are pieces of art." Urban, also a collector of lunch boxes and Beatles memorabilia, spent 20 years developing computer and audio/video products for General Electric, Olivetti, Apple Computer, Quantel and Barco. He said his new radio business allows him to combine his enjoyment of music and vintage audio with others. An unexpected pleasure of the business has been capturing a glimpse into other people's lives. Elderly people sometimes sell old radios after a spouse has died. A seller will share a little bit of the radio's history and what role it played in the life of the deceased. "The typical scenario is that grandpa had a radio. It broke, so he stuck it in a corner," Urban said. The family then decides to dispose of the radio at an auction or tag sale. At one recent estate sale, Urban bought a collection of radios that proved to be quite a find for Jody Eisenmann. She read about Urban's business and contacted him in hopes of finding a radio that her grandfather used to manufacture in the 1920s. Sure enough, a Freed-Eisenmann radio was among the collection Urban had purchased. Eisenmann gave the radio to her father as a surprise. "It's a nice memory," said Alexander Eisenmann, her father. Urban's radios are priced according to their condition and the amount of work needed for restoration. Radios offered for sale on his Web site recently ranged in price from $245 to $1,295. Among his favorite models is the Stromberg-Carlson, a rectangular, box-style radio from the 1920s. Another is the classic Philco Cathedral-style five-band radio, a 60-pound device with a large 8-inch speaker and rounded top, indicating the Art Deco curves and streamlining that replaced the 1920s box look. The Philco's wood cabinet has been restored to its original finish with two-tone wood, a front window dial, and several control knobs. He also has a 1933 Philco Tombstone radio, which has the squarish look of a headstone. Other notable radios in Urban's collection include a 1950s lamppost radio that can be mounted on a wall, a Harley-Davidson model that replicates the front half of a motorcycle, and those featuring comic book characters or corporate logos. 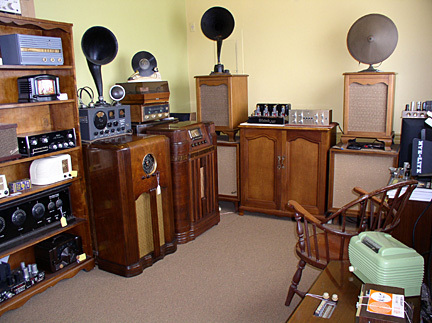 The collection, which he says does not really stay around long enough to collect dust, includes radios from the 1920s to the 1990s, a time when there were more than 1,000 radio manufacturers. Early wood-encased radios were replaced by plastic ones in the 1950s. Transistor radios became the rage until the 1970s, when novelty radios took over. These smaller, lighter and colorful radios came in all sizes and shapes and reflected the pop culture of the times. Ham radio enthusiast Gil Kellersman bought a late 1950s Zenith Transoceanic radio from Urban. Kellersman, a Westport computer broker, says he enjoys collecting radios for nostalgic reasons. More importantly, he said, "you can't duplicate the sound." To fully appreciate the sound quality, Kellersman particularly enjoys taking one of his radios out to his deck during the summer.